Years of single-womanhood can leave a gal wondering if she'll ever find a bonafide SuperLove. To be honest, I doubted that mine even existed. But that's where the MANifesting gets really interesting: believing is not a requirement. 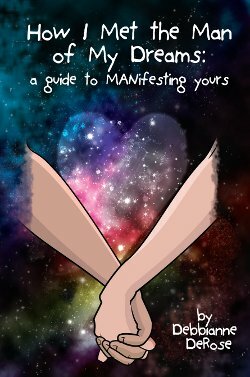 When my Dreamboat sailed into the harbor, I was so inspired that I decided to "reverse-engineer" the Law of Attraction for the single sisterhood, with humor and tough love. Whether you're new to the Woo, or a veteran looking for a breakthrough, you'll be hard-pressed to find a more practical, fresh (or fresh-mouthed) look at the MANifestation process. So much more than the metaphysical mechanics of rustlin' up a mate, it's about who you become in the undertaking. Oh and, of course, there's a juicy love story to prime your imagination. Prepare to laugh, to take an honest look within, and best of all, to be taken off the market! The winner is Starletta S.
Congratulations, Starletta from The Hope Chest Reviews!